This is my simple version of Outback Steakhouse’s Alice Springs Chicken except without mushrooms. 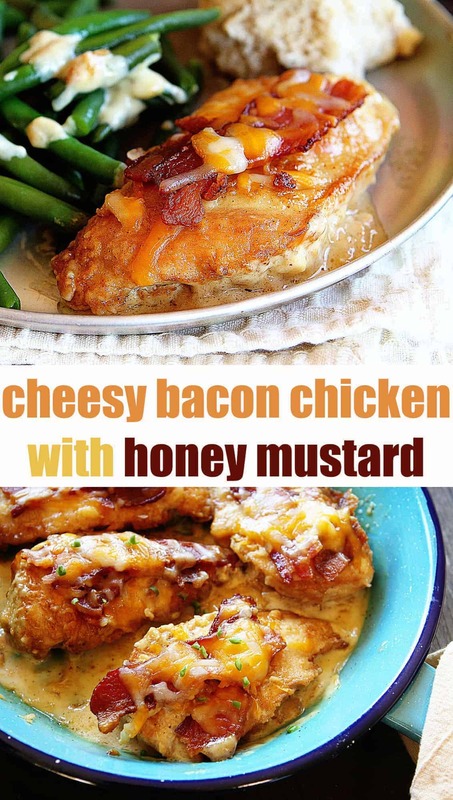 Cheesy Chicken with a seriously amazing homemade Honey Mustard sauce is a dinnertime winner! This sauce is a crowd pleaser… full of flavor and the perfect compliment to a well-seasoned chicken breast. 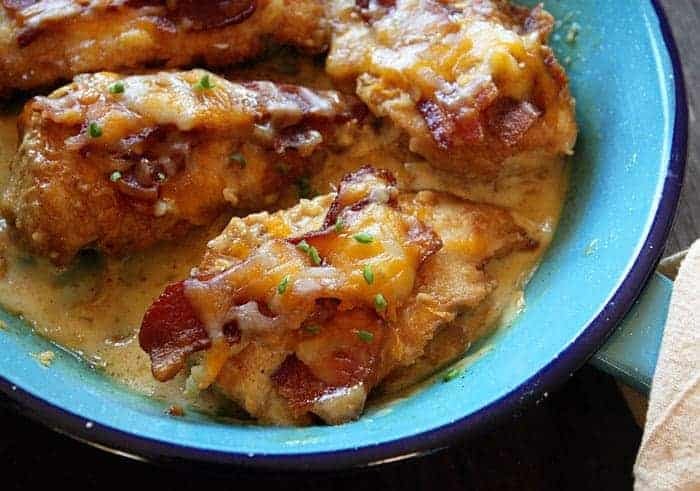 I highly recommend making this cheesy chicken recipe in a cast iron skillet or iron skillet or enamel fry pan. Both are oven safe. Skillets tend to be a favorite of mine, especially with chicken. The skillet heats evenly and helps cook the chicken to perfection! How to Make Cheesy Chicken? 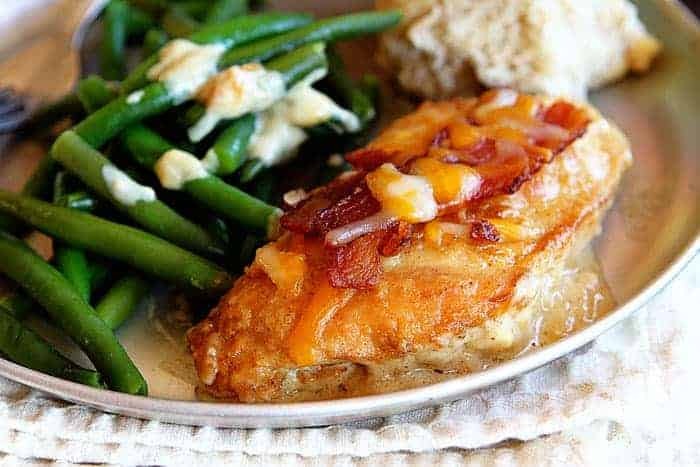 One thing to note in this cheesy chicken recipe is timing; the chicken does need to marinate, so I would plan on preparing the Honey Mustard Marinade in the morning or early afternoon. If you need to you can also prepare the marinade the night before and marinate overnight. For the cheesy chicken, I chose to use only Monterey Jack cheese but you can also add cheddar or whatever kind of cheese you have handy (within reason obviously). 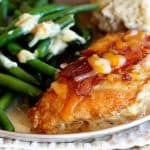 What can I serve with this cheesy chicken recipe? Cheesy Chicken with a seriously amazing homemade Honey Mustard sauce is a dinnertime winner! In a medium bowl, combine mustard, honey, oil, and lemon juice. Using a fork or small whisk, mix for about 30 seconds or until all ingredients are well mixed. Place chicken breasts on a large plate or small baking dish. Pour 2/3 of the marinade over the chicken. Cover with plastic wrap and place in the refrigerator for at least 2 hours. When you are ready to prepare the chicken, preheat the oven to 375 degrees F.
Turn heat off and remove skillet. Brush each seared chicken breast with a little of the reserved extra honey mustard marinade, being sure to save a little extra that you can serve on the side later with the dish. Stack two pieces of cooked bacon on each chicken breast. Spread 1/2 cup of Monterey Jack cheese into each breast. 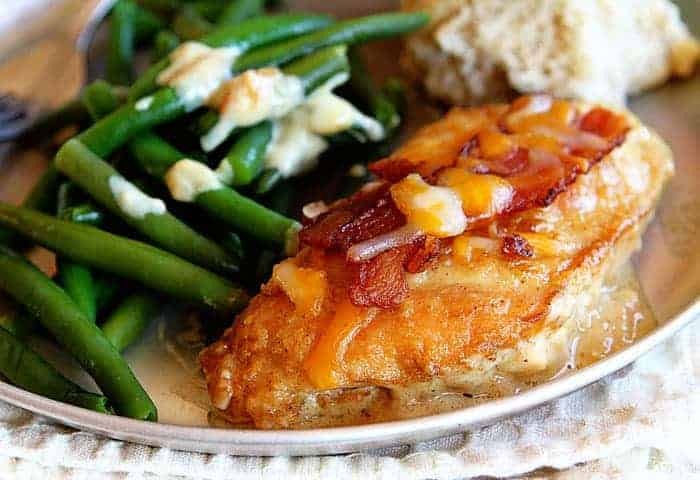 Bake the skillet of chicken for 5-7 minutes or until the cheese is thoroughly melted and chicken juices run clear. DID YOU MAKE CHEESY CHICKEN with Mustard Sauce? I wake up to folgers every morning! Can I use a different type of mustard? Yeah, I usually only buy whole grain or dijon mustard so I will try it with those. This is lovely, I should try it out! What’s the serving size and calorie count per serving? I would say it serves 4 since it has chicken 4 chicken breasts. Just my guess. You can figure out the calorie count on your own. I mean my goodness, smh. I am definately making this! The extra marinade needs to be cooked if it has come into contact with raw chicken or any utensil that has been used on raw chicken. Otherwise you’re begging for food poisoning. Not if you pour it into a measuring cup before it gets poured on the chicken. I was thinking the same thing. Save the marinade that the raw chicken was in to serve with the chicken later? Um…no!! It reads to use the reserved marinade that is LEFT over after you use 2/3rds of it to marinate the chicken. No where does it say to use the honey mustard that the chicken has been marinating in. Not sure why they are worried about salmonella. It was crystal clear in the recipe. Reserve. Use a little common sense. I’m making it now Mustard is to be spread with pastry brush on chicken. No need to touch all of it. This is so delicious. Feel free to read the recipe!!! LOL Love it! Anyway, it’s what’s for dinner tonight. Thanks for the recipe. Lmao..+1 on’ feel free to read the recipe’.. sad thing is.. After saying 2/3 of the sauce to marinade etc rest reserved ..people still feel important when they state the obvious. Sometimes think we should remove all this pesky warning labels and let nature sort it out.. tide pod anyone? The only sauce you use as marinade never touches the chicken. What you pour on the chicken stays in the baking dish and is baked. I was thinking that also. I went back and checked. You use 2/3rds of the marinade and refrigerate the rest until later. It doesn’t say anywhere in the recipe that the remaining marinade will be touching raw chicken. Yea, I separated mine. Some on the chicken, the rest in the fridge. I have been making something like this but using Havarti Cheese-Delish! If you have Messenger on your computer, you can save it there. I save mine to my timeline “Only Me”, cuz I forget about them in Messenger! Would you happen to know the carb count in this recipe? Looks so good! The only major carb content in this would be in the honey mustard sauce. If you use store bought, check the carb content on the label. If you don’t, it’s the carb and sugar content in the honey you use. All other ingredients are fine on a low carb diet (chicken, bacon, cheese, mustard). Probably zero. At least, very few carbs. I want to make this but I don’t have a cast iron skillet. What else can I use? You can use a standard skillet and then transfer it to a oven safe pan. Did you cook it in the pan and then bake? If you followed the recipe the chicken will be cooked through. HOW HIGH IN THE OVEN????????? +1, and yes Amanda, I seared four 4 minutes on a little hotter than medium high. I will say large breasts, and I figured it wouldn’t be cooked, but wanted to follow recipe. Now I will have ruined cheese. I will try again with thinner or sliced in half breasts. Very good point. I’ll add cheese at the last minute or so. I can’t wait to make this. I use a mustard-honey sauce on salmon so I’m sure I’ll love it on chicken. Looks delicious, I will make it. What if you only have am hour or so to marinate? Made this to a “T”. It was absolutely delicious! I don’t have an oven safe frying pan. Can I transfer the chicken into a baking dish after it is fried before baking it? I’m making to dish tonight. I can’t wait to tast it. I’ll be serving it with a side of rice and a side of corn. Never serve corn with rice or potatoes. Corn is a heavy carb just like them, and should be served on its own, with a green veggie. How about you do what you want & we’ll do what we want? Lmao, your comment made my day! I serve corn WITH rice all the time! Lol I mix corn in my buttered mashed potatoes! so yDou bake it at the 425 degrees or what? Wasn’t quite sure. I wish I could save this recipe on Pinterest!! If I sub the honey with Swerve/stevia/Splenda will I get the same results? This would be a perfect keto friendly recipe! I would not think that would be close to a good substitute. This was delicious! Since we’re low carb I substituted the honey with Carey’s Sugar free syrup. This will be a weekly meal. Thank you???? how do i receive your emails on my site. Is there any way I can print this recipe out? Also I would like to be able to see all of your recipes. I am sending you my email if you can add me to your friends list. Thank you. This is the first time ever that I have commented on a recipe anywhere, Facebook or otherwise. But, I just had to do it for this recipe! I made this tonight for dinner exactly the way the recipe is written and it was delicious. This will definitely be a do over in my house. This is a fantastic recipe, I will definately make this several times. Great for company too. You need to read the directions again. She does not say to save the marinade that wasvon the chicken. You save some for later(separately). Just an FYI for you. Recipe sounds great! I have really big breast.. So I’m assuming a little longer searing on a lower temp and a little longer in the oven? Wow.. I just re read that.. Really big chicken breast.. Lol.. It’s all they had at the store ???? Hahahaha! Good Lord! I never want to post a recipe after reading so many negative comments. Too much flack!!! Lol!!! Recipe sounds delicious. I read it, understood it, no problem. Yes, I am an immaculate cook! Going to try this dinner tonight but going to bbq it instead of baking, hope it comes out as good! I am so sorry to bother you again. I have tried to save several of your recipes like the cheesy bacon chicken and several others with no luck at pinning them to pinterest. It will either tell me there is no picture to pin or the label to actually pin something will only pin your website and not the recipe. I love your recipes and really want to save them and share them. I think your web page tech still needs to do work on the site. 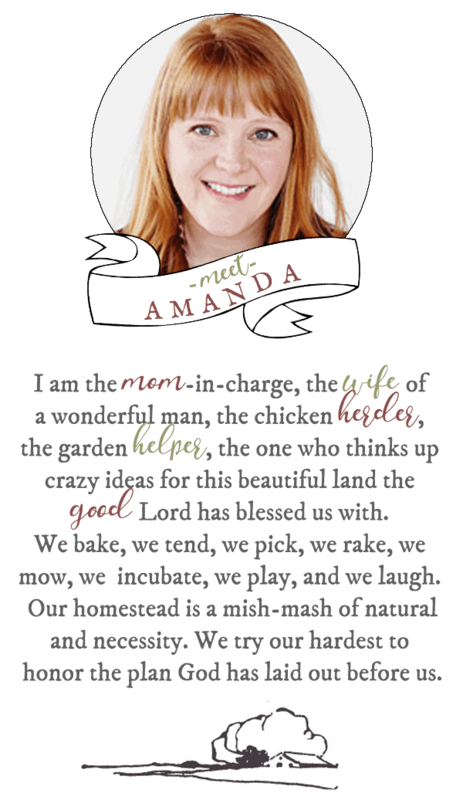 I just hope she/He does not have to go thru each of your recipes. Sorry again! can i velvet the chicken breast before marinating? I’m afraid the chicken is dry. would that change the whole recipe? thanks! Instead of putting it in the oven can you put it on foil on the grill for the last step? I wanted to make this, but I don’t have an oven safe skillet. So I made it in the slow cooker. I put boneless, skinless chicken breasts in the slower cooker, mixed up the marinade and poured it over them, and cooked it on high for four hours. Came out tender and with so much flavour. It was a big hit with my family. Thank you! I am making it for dinner tonight. It makes me so happy to be able to make my favorite Outback meal at home! I am putting the mushrooms on tho. Pretty easy recipe. The honey mustard marinade is yummy! Thank you for sharing this recipe. Monday I am making the chicken potpie casserole! If I wanted to make this a freezer recipe, could I sear the chicken then freeze, then on the day I’m going to use it, add bacon and cheese and bake? I’m making this as we speak. My only concern is the given frying and oven time. Doesn’t seem near enough for 3-4 whole chicken breasts. And as far as the sauce I don’t plan on useing of the extra sauce. Dumb me didn’t reread the directions so if I decide I want extra I may make up a small portion. I made this today, so good, I put jalapenos in the marinade and chicken, then I cooked up some extra jalapenos in the pan I cooked the bacon in (yes I used a stove stop pan for the bacon) and when I put everything in the oven i put the cooked jalapeno on top. The extra marinade sauce I made into a gravy type sauce to go over everything on my plate. Also I used mozzarella and cheddar cheese on my chicken and put it under the broiler till cheese turned brown. So yummy.